Hello my foodies! How are you doing today? Feeling like something healthy but still delicious? If your answer is positive, keep reading! After yesterday’s recipe of the healthy version of the tradicional pancakes, today I want to share with you this fit version of the traditionally Italian dish Spaghetti with pesto that I prepared (and ate) yesterday. The secret of this recipe is using zucchini instead of pasta for the spaghetti. By making this simple change you’ll get a much healthier version of this dish, lower in calories and carbohydrates and richer in vitamins which is great for weigh-loss diets or just to increase the amount of vegetables of out diet. Something that will do as no harm, that’s for sure. After this brief introduction, let’s get into the recipe itself. First of all, you’ll need a special tool called Spiralizer. This will make the zucchini slicing task much easier. I purchased it through Amazon for around 8-9 euros. Here you have a link if you are interested: Spiralizer in Amazon. After getting this tool, you’ll most probably need to know the slicing technique to use it. But don’t panic! It’s supersimple, as you can see in the next video. 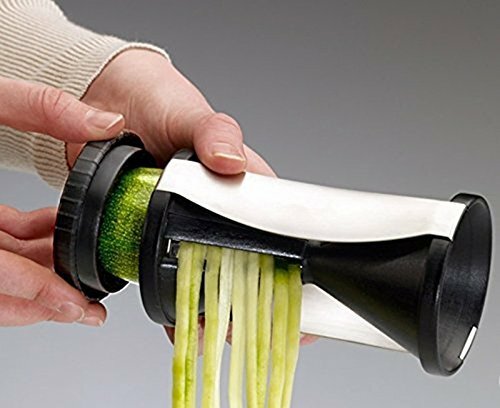 One useful tip when using the spiralizer would be to avoid overripe zucchinis because if they are too soft they will probably break and will make it so much harder to get the spaghetti shape. The hardest part is done once you have the spaghetti. All you need to do now is boil them or steam them for 3 minutes, unless you prefer them raw as they are, of course. After that, wash the veggies, chop them and cook them in a frying pan with a little bit of olive oil. Do the same with the chicken: dice it and cook it in the same pan. You can do it all together with the veggies or separately, as I chose to do. It’s not a problem because it doesn’t take long to brown it. Put a small amount of zucchini spaghetti in a plate. Add a few full spoons of veggies and chicken. Then dress it with some pesto sauce and mix it all together. And don’t forget the bread! Here you have a pic of it right before I devoured it! It’s superdelicous and yummi! Trust me! I would say it even tastes better than its traditional version. Good appetite!! and enjoy your meal, always! !